This velvety Slow Cooker Strawberry Hot Chocolate can not only be made ahead of time, but can also serve a crowd. You’ll be amazed that something that uses just five ingredients and takes just five minutes to prepare can be so delicious! Original content posted January 2018. Updated February 2019. When we moved to Colorado, I quickly learned that I could have our milk delivered each week by a local dairy. Friends, when you typically go through over five gallons of 1% milk, a half gallon of whole milk, a quart of strawberry milk and a pint of whipping cream each week, you see why this concept is downright heavenly. And why our milk delivery guy likely wonders exactly how many people live in our house. 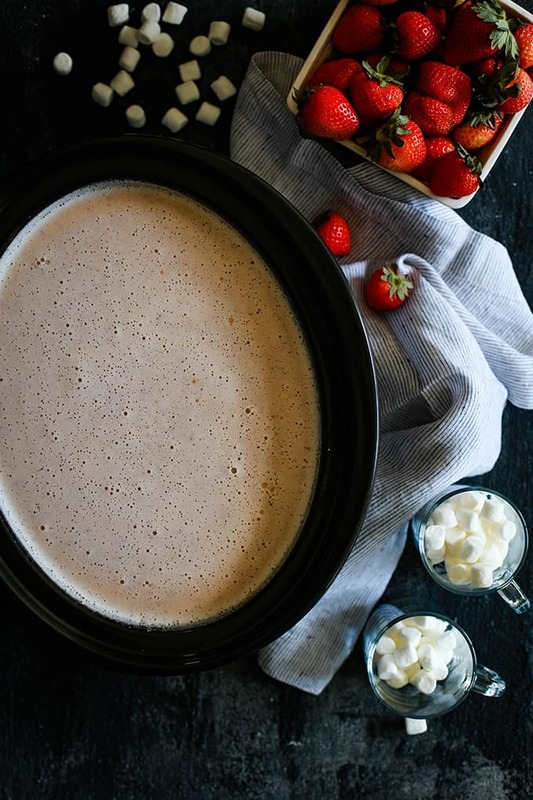 Our weekly milk delivery is also the inspiration behind this Slow Cooker Strawberry Hot Chocolate. That weekly quart of strawberry milk is for our five year old son. His weekly treat that he refuses to share with his sisters. 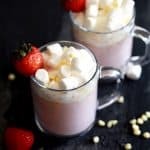 He thought this Slow Cooker Strawberry Hot Chocolate fell under the same no sharing rules as well. Good try, buddy! Instead, this was a great treat on one of our winter vacation days. I love starting the slow cooker first thing in the morning so that we’re able to enjoy hot chocolate all day long. The perfect cold weather treat. I have a bit of a love affair with hot chocolate. 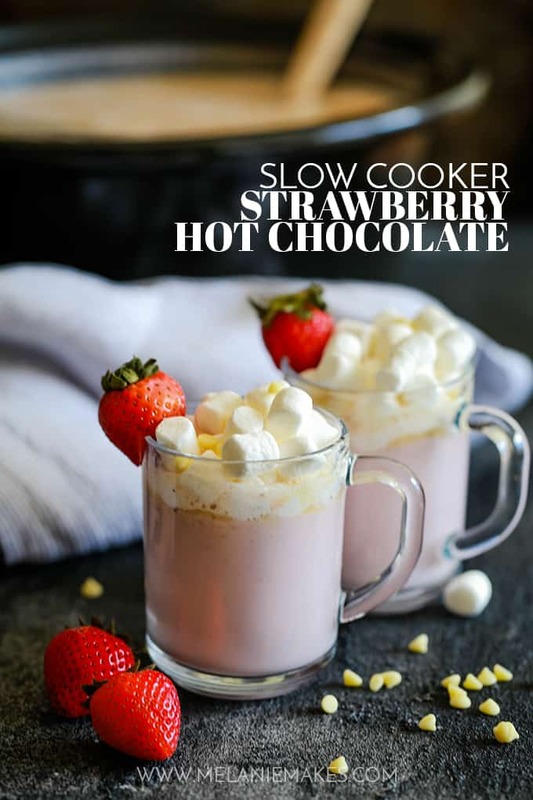 This Slow Cooker Strawberry Hot Chocolate joins my recipe box alongside my Slow Cooker Andes Mint Hot Chocolate, Slow Cooker Almond Joy Hot Chocolate and No Added Sugar Chai Dark Hot Chocolate. Because of it’s light pink hue, I’m thinking it would be perfect for a Valentine’s Day party, a little girl’s birthday party or even a baby or wedding shower. Being able to make it ahead of time and make a bar of toppings to go alongside makes it the perfect party beverage. I think it would be perfectly paired with these Strawberry Sugar Cookies as well. Oh, the possibilities! TIP: Depending on the type of strawberry milk you use, your hot chocolate will range in color from a pale to vibrant pink. Our dairy has taken the dye out of the strawberry milk that we drink, so it’s actually white. Instead, the pink hue in my hot chocolate only comes from the frozen strawberries that are blended into the hot milk and cream mixture. Of course, you’re always more than welcome to use food coloring or additional strawberries to up the pink-ness of your drink. 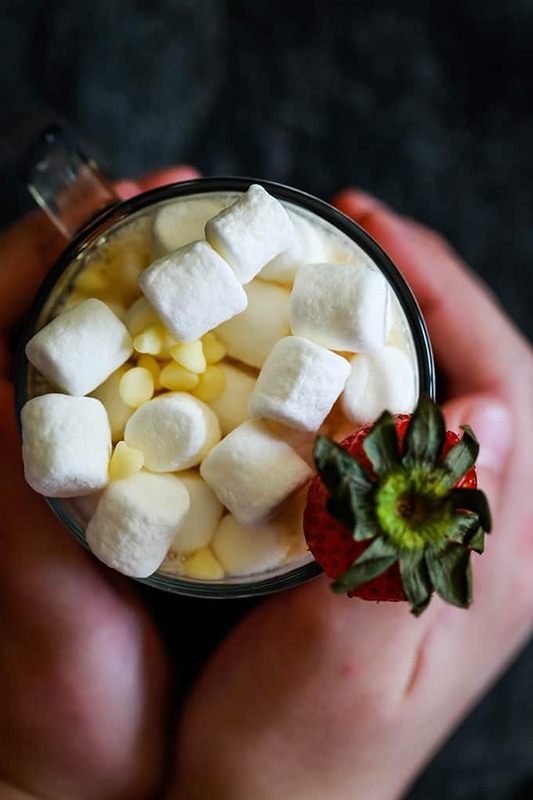 TIP: If you don’t mind what color your hot chocolate is and would like something more like a Chocolate Covered Strawberry Hot Chocolate, feel free to substitute milk or dark chocolate chips instead of the white chocolate chips. TIP: If you’re lucky enough to have any left over, I like to store this delicious drink in mason jars in the fridge. Then when I’m craving a steaming mug, it’s easy to pop in the microwave or pour into a saucepan and warm on the stovetop. It makes for a perfect after school treat for my crew! 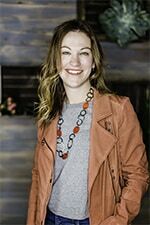 If you’ve tried this Slow Cooker Strawberry Hot Chocolate or any other recipe on Melanie Makes, please let me know your thoughts in the comments below. I love hearing from you and respond to each and every comment! 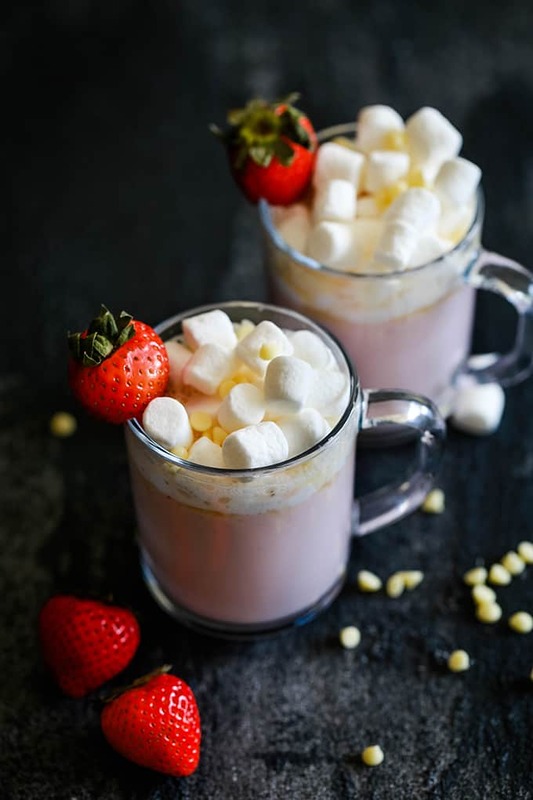 Strawberry milk, cream, sugar, white chocolate chips and frozen strawberries are blended together to create this velvety Slow Cooker Strawberry Hot Chocolate that can not only be made ahead of time, but can also serve a crowd. 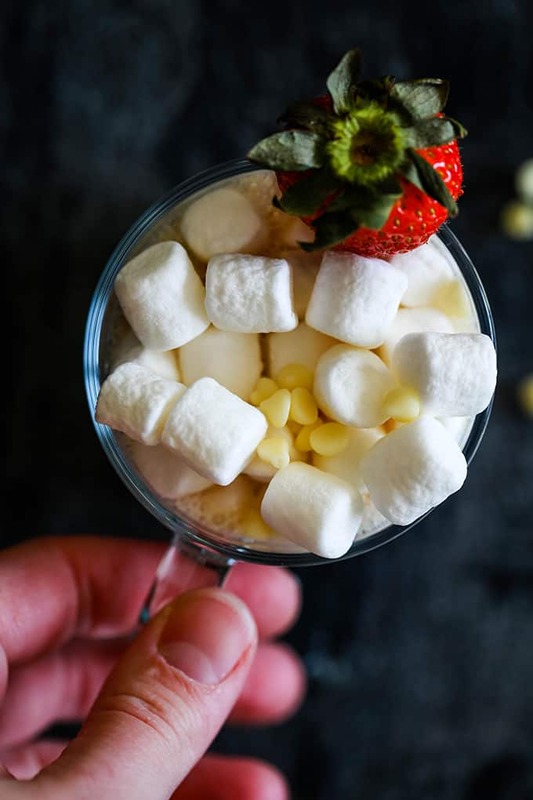 Top each mug with a mountain of marshmallows, more white chocolate and garnish with a fresh strawberry and you’ve got yourself a mug of hot chocolate that’s sure to be a hit with anyone lucky enough to have a sip. Looking for some other strawberry flavored treats to pair with your hot chocolate? Check out these flaky Strawberry Shortcake Scones, these pretty Strawberries and Cream Magic Bars and these sparkly Strawberry Truffle Kiss Cookies. Perfect for this chilly weather! I need to try this right away! I love hot chocolate and this version is amazing! Strawberry hot coco is a great idea! Yum - love this idea! I need to try soon! I think your crew would love it! I need this on a cold night! Looks yummy! Perfect for cold weather temps this week! Looks so beautiful and tender. Yum Yum Yum! Cannot wait to try this! Love! These look so amazing, and I love how you made them! I can confirm that it is! Perfectly pink, perfectly delicious! Pour me a mug right now! I bet you'd love it, Sabrina! All my favorites in one cup! I want it! Oh my goodness!! This looks SO good!! Can't wait to try it! I need to make this soon and keep it on demand. Such a great idea! I'm going to make this for my son's school Valentine's Day party! So perfect!! You'll earn a gold star for sure, Jen! Love how you made this in the slow cooker! Who wouldn't want a cup of this??? YUM! My son's sentiments exactly, Amy!